Running into unknown places is my favorite thing about being a Spotter. There is always something new to discover in Madrid, which makes my spotting really easy and fun. This time was no different. As a book lover myself, I have to tell you all about this second-hand bookstore and antique shop. “Arranca Thelma” has mostly antique books, some are even discontinued and there are classics in foreign languages. You can also find posters or small paintings. 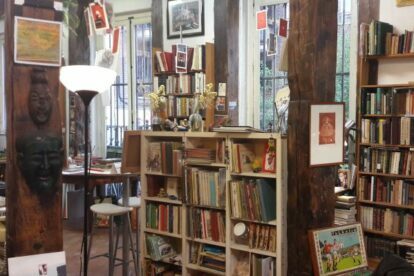 This bookshop has a bohemian vibe that I Iove; actors, musicians and filmmakers gather here for all kinds of art related activities. The shop can also become a concert hall from time to time which they organize to bring together local artists. Films are a big theme as well; its name is actually a reference to a quote from the movie “Thelma and Louise”, meaning something like ‘hurry up Thelma’ (if you haven´t seen the movie or want to revisit it, now is the time). There are movie posters all over the shop too. It is not open on weekends; you can only visit it on weekdays from 17:00 to 20:00. There is a small area to sit and enjoy some coffee. The first time we came in, we talked to a musician who explained to us the place’s history and showed us around. Just friendly artist vibe in a beautiful shop filled with old books — that’s what you will get.